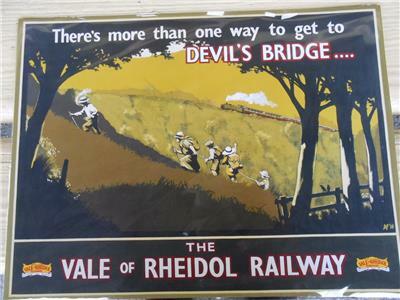 Brand new poster measuring 40x30cm fom an original painting commissioned by the Vale of Rheidol railway. AG Cain's usual humorous retro style showing the family struggling below the railway, as a train goes past (hauled by 1213 'Prince of Wales' in GWR livery, for those who want to know). As always with this family, the father pushes on ahead regardless and markedly devoid of any luggage, whilst his sherpas, ur minions, ur family.... struggle behind. A typical 1930s scene? proving that there are indeed more than one way to get to Devil's Bridge, but there's only one way to do it in comfort and style (unless you are a red kite, of course). The railway is open every day from April to October and then weekends in November. Santa and Halloween excursions also provide entertainment during the season. We are having a 'roaring 20s and 30s' event on september 16/17, so pack your rucksack and rope up your children ready!